indianaquariumhobbyist.com Forums » Post 199096 » Re: Some old wooden hoods/Cabinets of Bangalore. http://indianaquariumhobbyist.com/community/ :: View topic - Some old and new wooden hoods/Cabinets. Some old and new wooden hoods/Cabinets. Posted: Mon May 31, 2010 11:46 am Post subject: Some old and new wooden hoods/Cabinets. Some old DIY wooden hoods from Bangalore. Madans. Just a simple wooden frame on top to hold down MH lights. Clicked 4th June 2006. Mine. A painted wooden hood. 2 Pll+2 tubes. Clicked 14/11/2006. Karthik. Packing wood. Clicked 5th July 2008. Posted: Mon May 31, 2010 12:09 pm Post subject: Re: Some old wooden hoods/Cabinets of Bangalore. Posted: Mon May 31, 2010 12:13 pm Post subject: Re: Some old wooden hoods/Cabinets of Bangalore. Posted: Mon May 31, 2010 1:05 pm Post subject: Re: Some old wooden hoods/Cabinets of Bangalore. A whole lot of LFS racks made of packing wood. Posted: Mon May 31, 2010 2:33 pm Post subject: Re: Some old wooden hoods/Cabinets of Bangalore. Posted: Mon May 31, 2010 4:01 pm Post subject: Re: Some old wooden hoods/Cabinets of Bangalore. Members are requested to post pics of their wooden hood/cabinets. On the bottom right a rubber wood & stainless steel hood. Four tubes. Covered by the Pradeep(PC) and Pradeep(simhan) pic of my wooden hood and its cabinet. The same is painted wooden hood, the second pic on this thread. Clicked 22/11/2006. Posted: Mon May 31, 2010 4:33 pm Post subject: Re: Some old wooden hoods/Cabinets of Bangalore. Posted: Mon May 31, 2010 4:50 pm Post subject: Re: Some old wooden hoods/Cabinets of Bangalore. is packing wood cheaper and where do one get it from? is is strong enough to hold 3feet tank? Posted: Mon May 31, 2010 5:02 pm Post subject: Re: Some old wooden hoods/Cabinets of Bangalore. Posted: Mon May 31, 2010 5:39 pm Post subject: Re: Some old wooden hoods/Cabinets of Bangalore. And ya, I do have some hoods and stands made outta packing wood. Mine look horrible though! Now I'm left wondering why I even bought them. Posted: Mon May 31, 2010 8:41 pm Post subject: Re: Some old wooden hoods/Cabinets of Bangalore. Not all that bad Karthick but, kinda weird dimensions what do you keep in there? cichlids? Posted: Mon May 31, 2010 9:31 pm Post subject: Re: Some old wooden hoods/Cabinets of Bangalore. One is my first planted tank, and the other is a DIY Cascade Filter I fabricated for my Discus tank. Posted: Mon May 31, 2010 11:24 pm Post subject: Re: Some old wooden hoods/Cabinets of Bangalore. Dude is the hood/cabinet weirdly shaped? Or maybe its the lousy phone cam shot. There's a lone Vieja synspilum hiding behind the wood and rockwork, that will be taken by a friend soon. I dislike the hoods and stands made outta packing wood. The above hood/cabinet ain't made of packing wood! I'm curious to see your hoods and cabinets, and also whats in between them! Posted: Mon May 31, 2010 11:32 pm Post subject: Re: Some old wooden hoods/Cabinets of Bangalore. Awesome thread Trevor...just love Madan's hood...pun unintended. 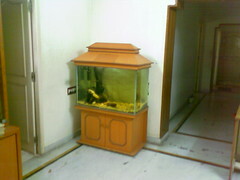 Posted: Tue Jun 01, 2010 12:10 am Post subject: Re: Some old wooden hoods/Cabinets of Bangalore. Heres mine...completely done by me except wiring(electricity goes over my head ).